Air Canada flight ACA-877 had to be diverted to Ireland’s Shannon Airport on Friday after an elderly female passenger became disruptive and bit one of the crew members. Irish police were called to meet the plane after it landed and the woman was arrested. The Boeing 777-300 jet was traveling from Frankfurt to Toronto when a passenger seated in first class became unruly and assaulted at least one of the air stewards. Reports say she was accused of biting and scratching members of the cabin crew. Following the incident, the woman, who was in her 80s, was restrained, according to Irish media. “It took two or three of the attendants to subdue her and they were thinking about, I think, putting her in some kind of tether. And they did that because she was not having anything to do with them,” passenger Al Hinnegan told CBC News. Even though the flight was 1,000 kilometers north from Shannon airport, the crew made the decision to turn around. The pilot contacted the Irish Aviation Authority’s (IAA) North Atlantic Communications Service center at Ballygirreen, in the west of the country to, request permission to land in Shannon, after describing the situation on board the airplane. The plane was able to land successfully in Shannon at 8:15pm local time on Friday, with the Irish Gardai police force as well as airport law enforcement officers dispatched to arrest the elderly woman. The Independent said a 79-year-old woman was arrested, citing an Irish police spokesman. It had earlier been reported that the elderly passenger was 89-years-old. The woman was eventually released following questioning and is scheduled to undergo a fit-to-fly screening test before resuming her journey to Canada, the International Business Times reported. Following a four-hour delay, the plane finally made it to Toronto, landing at 11:39pm local time. 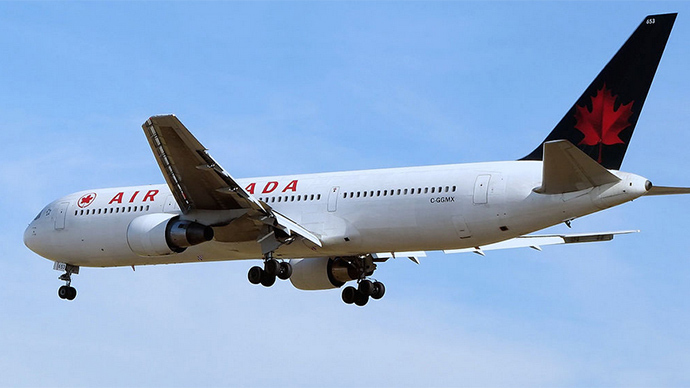 There was also another report of violence aboard an Air Canada flight on Friday. Oliver Minatel, who is a professional footballer and plays for Ottawa Fury was attacked by another passenger on board a flight to Atlanta, according to CBC News. The passenger used a headphone cable to try to choke Minatel while the plane was airborne. Once the aircraft touched down, the passenger involved was arrested in Atlanta and the FBI said he was transferred to medical and mental institution for evaluation.